Curtain up! I beg silence from the circle, and hearts of Herculean hale; couch-cowerers, duvet-divers and nursers of nausea – you have had fair warning! Tonight, oh tonight, the most grisly of girls will be laid clinical before your ogling optics – the most repulsive of Rapunzels, beastly Belle before your perverse peepers. I give to you… Madame Delphine LaLaurie, Grande Dame Guignol, American socialite and veritable godmother of gore. So what did this Cher Belle Gordon Lewis do to resign herself to the unsavoury annals of American history? She was, oh spritely reader, one of New Orleans’ most legendary legendary serial killers. Killer. Due emphasis, as I am sure I can convince you, on her truly legendary status. There is little background information on the fair lady that Wikipedia cannot also provide. But for the sake of loading a new tab, and my losing an audience, I can reveal that: she was born Marie Delphine MacCarty, allegedly circa 1775, into a wealthy New Orleans family. There are rumours that her mother was killed by a slave, and a series of marriages cut unfortunately short, as she was twice widowed – though married a third, Dr. Louis LaLaurie in June 1825. The persistent paragraphic punctuations of ‘allegedly’ and ‘rumour’ are, I’m afraid, going to be quite a feature of this bileography. It is my suspicions, Watson, that much of the details of her youth came into being only post-Tempo di Massacro fame; an attempt, a justification of sorts, to account for her antisocial tendency to wine, dine and dismember. It was with Louis that Mme Delphine bought a mansion on Royal Street in New Orleans in 1831. And it is inside this house, to make Amityville blush, that I shall now lead you. 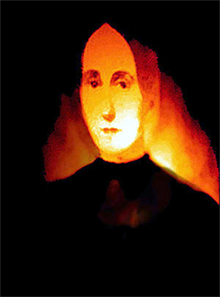 An article in the New Orleans Bee, dated 11th April 1834, informs its readers of a fire which had broken out at the LaLaurie’s the day before (10th April, for the mathematically challenged), specifically in the kitchen – a building separate from the mansion itself. In spectacular tabloidisms, it describes how the public entertained ‘the horrible suspicion … that some of the inmates of the premise … were incarcerated therein’. However, after having demanded the keys, for the doors were locked, the public were refused them by the charmless lady and her husband, in – and this is a particularly brilliant sentence – ‘a gross and insulting manner’. After somehow breaking in (we are not enlightened as of their means of breaking & entering…) the heroic public were apparently met with a hideous sight, a sight the Bee claims that ‘language is powerless and inadequate’ to describe… but dammit, they give it a bloody good go: ‘seven slaves more or less horribly mutilated were seen suspended by the neck, with their limbs apparently stretched and torn from one extremity to the other’. 12th April 1834, the Bee runs another article on the LaLaurie’s, those glory-guzzlers. This time, however, and this is where we start to smell the presence of some urban little rodents, the level of horror is remarkably toned down. Atop yesterday’s raging plate of indignation, the Bee has served us a great slice of humble pie. The primary concern of the article are the costs of damages to the property ($40,000, allegedly), although the newspaper suggests this may be somewhat ‘exaggerated’. A bold claim, in light of their own truth-bendings the day prior. Another appendage records the testimony of a number of visitors to the LaLaurie property, the citizens Montreuil and Fernandez. They conduct a search and to their sheer unholy horror they find… nothing. Upon the suggestion of a third man, Felix Lefebure, they do eventually discover two slaves chained up behind a locked door, who have difficulty in walking, and a third with ‘a deep wound on the head’. No one dead, however. No gore. No guts. No fun. Interestingly, it is Dr. LaLaurie who takes the starring role in this second article, and to whom is given the rather hilariously rehearsed final words. When asked if he had any more slaves locked up, he replied ‘”that there were persons who would do much better by remaining at home than visiting others to dictate to them laws in the quality of officious friends“‘. Boo yah. What a joker. So why the enduring history of Delphine LaLaurie as New Orleans most notorious no-goodnick? It’s a puzzler. Evidently, the LaLauries kept slaves, and it is unlikely they were treated in the most humane manner possible. There is perhaps more truth in a story that recounts an incident in 1833, where the couple were taken to court after a little slave girl fell to her death from one of the house’s balconies. But I am inclined to take that as mere bad luck, at most severe negligence, than as a malacious act. The public, however, seem to have been incensed with LaLaurie, and were determined to show her as the cruella she, allegedly, was. Alas, it was not to be. At least, not anymore, now that I have convincingly proven her quasi-innocence. It was just an eager tabloid, and equally eager mob-mentalities. That isn’t to say there aren’t those still promoting the Bathorial memory of LaLaurie. A book, a book I own, and have unfortunately had the misfortune to read, a book called Journey Into Darkness: Ghosts and Vampires of New Orleans, available from all good freak-shows, mystics and frauds, appears to be the earliest source of some of these outrageous claims against LaLaurie. Published in 1998, it is unlikely to convince the historian of its accuracy, especially as its few footnotes are plain wrong: details it claims to take from the Bee, just don’t exist in the published articles. It is almost painfully safe to say that this book just makes it up. Its author? A lady with a vested interest in all things macabre in The Big Easy – she runs ghost tours of the city. And is she qualified to do such dangerous things? Oh boy, is she ever. She is both an authority on eclectic magic and holds a degree/award/farce in Oriental Natural Healing and Integrated Body Mind Therapy. Oh, also, she believes in vampires. I think I would enjoy eclectic magic. Most magic is just too… mainstream. So, slaves, lies and masking-tape, and the genesis of an exceptional horror film. post-script; that painting isn’t really haunted. Sorry to scare you by saying that it was. Oh, and if you ever find yourself worrying that something really is haunted, just remember… it isn’t. It isn’t possible.